Badura and Grijalva discuss their research and how organizations can apply their findings. BUFFALO, N.Y. — Women hold just 26% of executive-level positions in S&P 500 companies — and sadly that is no accident, according to a new study by researchers in the University at Buffalo School of Management. 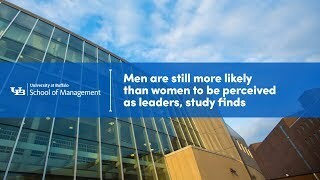 The study, which was made available online in March ahead of publication in the August print edition of Personnel Psychology, found that, on average, men are more likely than women to emerge as leaders. The research team — led by doctoral student Katie Badura and Emily Grijalva, PhD, assistant professor of organization and human resources in the UB School of Management — aggregated 59 years of research, encompassing more than 19,000 participants and 136 studies from lab, business and classroom settings. They discovered that although the gender gap has narrowed in recent decades, it still persists. The researchers primarily attribute the gender gap to societal pressures that contribute to gender differences in personality traits. For example, men tend to be more assertive and dominant, whereas women tend to be more communal, cooperative and nurturing. As a result, men are more likely to participate and voice their opinions during group discussions, and be perceived by others as leaderlike. While group size and participants’ ages did not affect the gender gap, the study found the length of time participants spent together was an important factor in whether men or women emerged as leaders. The longer a group spent together, the less gender influenced who emerged as the group’s leader. For managers, the researchers suggest promoting the value of communal behaviors in performance evaluations, prompting quieter individuals to share their ideas and being mindful of any unconscious biases you or your staff may have. The project was partially supported through a grant from the University at Buffalo Gender Institute. Badura and Grijalva conducted the study with Daniel A. Newman, professor of psychology and labor and employment relations, University of Illinois at Urbana-Champaign; Thomas Taiyi Yan, PhD student, University of Maryland Robert H. Smith School of Business; and Gahyun Jeon, postdoctoral research associate, Northwestern University.